1,7Department of Pharmacognosy, Captain Srinivasa Murti Research Institute for Ayurveda and Siddha Drug Development, CCRAS, Govt of India, Arumbakkam, Chennai-600 106, Tamil Nadu, INDIA. 2Department of Pharmacology, Sri Ramachandra College of Pharmacy, Sri Ramachandra University, Porur, Chennai-600116, Tamil Nadu, INDIA. 3Deparment of Pharm. Analysis, C.L.Baid Metha College of Pharmacy, Thoraipakkam, Chennai-600 097, Tamil Nadu, INDIA. 4,5Department of Pharmacognosy, Captain Srinivasa Murti Research Institute for Ayurveda and Siddha Drug Development, CCRAS, Govt of India, Arumbakkam, Chennai-600 106, Tamil Nadu, INDIA. 6Deparment of Chemistry, Govt. Arts College, Ariyalur-621 713, Tamil Nadu, INDIA. 8Department of Pharmacology, Captain Srinivasa Murti Research Institute for Ayurveda and Siddha Drug Development, CCRAS, Govt of India, Arumbakkam, Chennai-600 106, Tamil Nadu, INDIA. 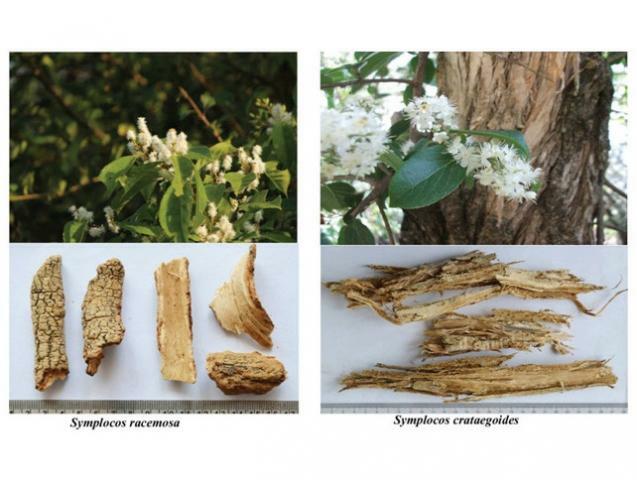 Introduction: Comparative powder microscopic and HPTLC studies were carried out on stem barks of Symplocos racemosa Roxb. and Symplocos crataegoides Ham. to differentiate its identity in Ayurvedic formulations. Method: Powder microscopic and HPTLC studies of these barks were undertaken on a comparative basis and results are reported in this paper. The authentic samples are cleaned, powdered and passed through sieve No. 80. A few mg of powder was stained with saffranin, Toluidine blue and Iodine and photographed under different magnifications with the help of NICKON Labphot -2. HPTLC studies were followed by Sethi and Wagner et al method. Results: The colour, taste, cork cells, fibres, sclereids, starch grains, calcium oxalate crystals, number of spots and Rf values of HPTLC are found to be differentiating diagnostic characters in powdered form of S. racemosa and S. crataegoides. Conclusion: The findings of the present study is believed to be helpful in standardization of Ayurvedic formulation containing stem bark of S. racemosa and S. crataegoides as ingredients in powder form. The study sets the specific microscopic protocol and HPTLC finger print of the two drugs and may lead to global acceptance and reputation of the Ayurvedic system. Keywords:Authentication, Curna, Dasamularistam, Lodhra, Lodhrasavam, Pharmacognosy. Govindarajan N, Cheekala UM, Arcot S, Sundaramoorthy S, Shanmugam M, Duraisamy R, et al. Comparative Powder Microscopic and HPTLC Studies on Stem barks of Symplocos racemosa Roxb. and Symplocos crataegoides Ham. Pharmacognosy Journal. 2016;8(4):346-351.